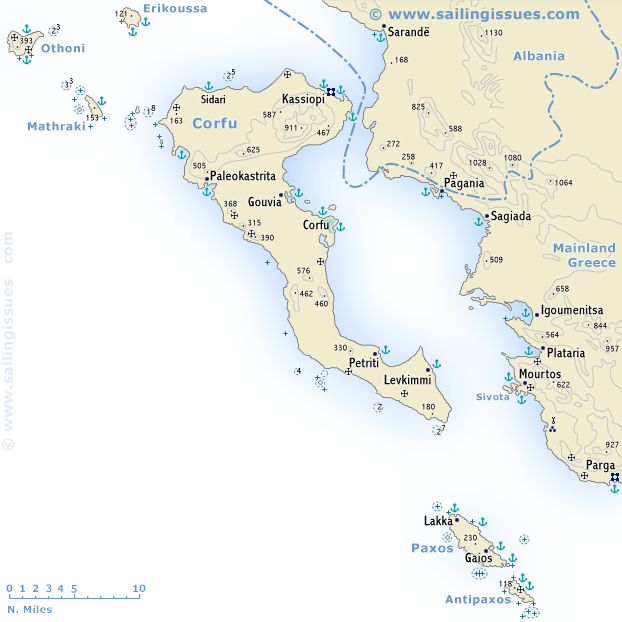 Corfu - Κέρκυρα - Kerkira is the most important and most northerly of the Ionian Islands and is situated only 1 nm off the coast of Albania and the Greek region of Epirus (mainland Greece). It houses one of the main charter bases for most yacht charter companies and offers gentle green uplands in the south and rugged limestone hills in the north, rising to 911 m in the double peak of Pantokrator. Anchor at Sidari at the North of Corfu to swim in the Canal d'Amour; lovers will stay together for live. Paxos is an attractive little island south of Corfu covered with subtropical vegetation, with beautiful bathing beaches and good diving grounds. On the south coast the Ypapanti sea-cave (seals) is worth visiting. Anti-Paxos is further south and offers beautiful secluded anchorages and beaches. The 100 or so inhabitants live by sheep farming or fishing. Corfu (ancient: Korkyra, Corcyra) is identified as the Homeric Scheria, the land of the Phaeacians and their king Alkinoos. The oldest traces of human settlement on the island point to the presence of farming peoples who may have come from Italy. Corfu was colonized by Corinth in 734 BCE, but developed into a powerful State, which threatened the mother city. A naval victory by the Corinthians over the Corcyraeans in the Sybota Islands (probably round the mouth of the River Kalamas, which is now silted up) was a major factor in the outbreak of the Peloponnesian War. In 229 BCE the island was captured by Rome, and when the Empire was finally split in two in 395 became part of the Byzantine Empire. The medieval name of the island, now the accepted English name, is believed to be derived from the Greek Koryphi (Peaks). From 1386 to 1797 Corfu was held by Venice, thereafter it was briefly part of the Napoleonic empire; and in 1815, together with the rest of the Ionian islands, it was assigned to Britain. It was reunited with Greece in 1864. In the course of its eventful history the island was frequently devastated and plundered, so that it has preserved few relics of ancient or medieval times. The island's capital, Corfu (Kerkira), is beautifully situated on a promontory on the east coast, dominated by the Neo Frourio (New Fortress). The ancient city is farther south. 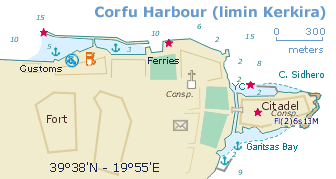 Corfu is the seat of both a Greek Orthodox and a Roman Catholic archbishop. From the harbour you can go either east on the road running above the seafront (view), passing the old royal palace, or south-east along Odos Nikiforou, the town's busy main road. An attractive excursion from Corfu town is to the villa of Akhillion, 16 km south. This villa in Italian Renaissance style, situated at an altitude of 145 m, has magnificent gardens and panoramic views. Three kilometres further south is the charming fishing village of Benitses and its remains of a Roman villa. The old harbour of Corfu/Kerkira just east of the customs harbour has the best shelter for the prevailing NW winds. 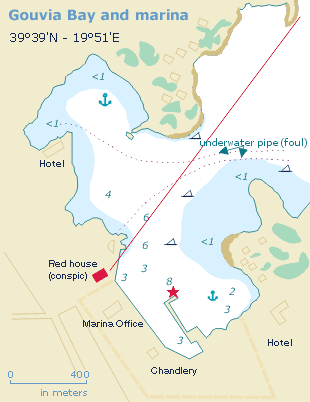 The Corfu Yacht Club is usually for member only, but the smaller Naok Yacht Club at the other side of Cape Sidhero has a few berths for visitors. 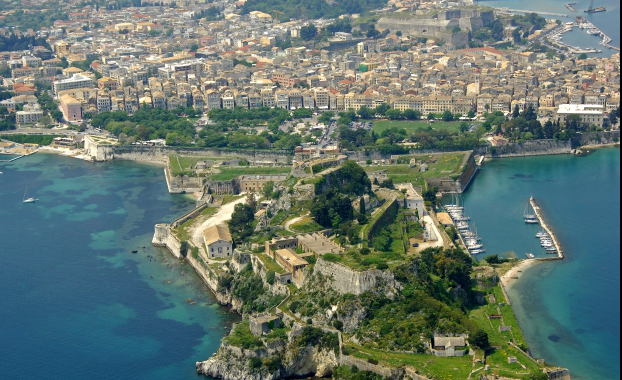 ↑ Aerial photo of Corfu fortress citadel. 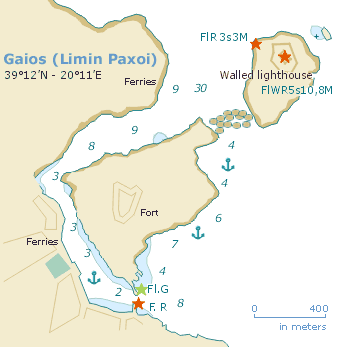 Gaios is the principal port of Paxos Island. On the islets off the harbour are a Venetian fort and the former Monastery of the Panayia. You can moor right in the middle of the busy touristy scenery of this charming place. Paleokastritsa - on the West side of Corfu Island - is a lively and attractive tourist resort dominated by the Monastery of Panayia Theotokos on a high crag. Near the village there are seacaves. From here it is a 1.5 hours climb (with guide; stout footwear required) to the ruined Angelokastro Castle (13th c; panoramic views). Lots of caves can be reached by tender or RIB. Gouvia is located 5 nm north of Corfu town and features a Venetian arsenal of 1716. One can climb to the summit of Mount Pantokrator for a beautiful view of the surroundings and an abandoned monastery of 1347. The village of Kondokali - adjacent to Gouvia - is nowadays more German or English than Greek. Fortunately, the facilities are excellent. 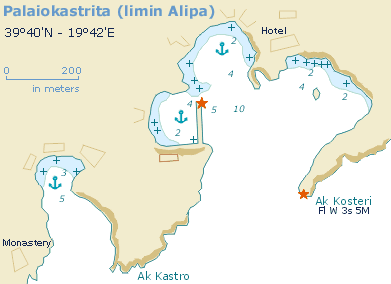 Gouvia marina is a major base for skippered, crewed and bareboat yacht charters in the north Ionian sea. The other bases are Lefkas and Preveza, further south. 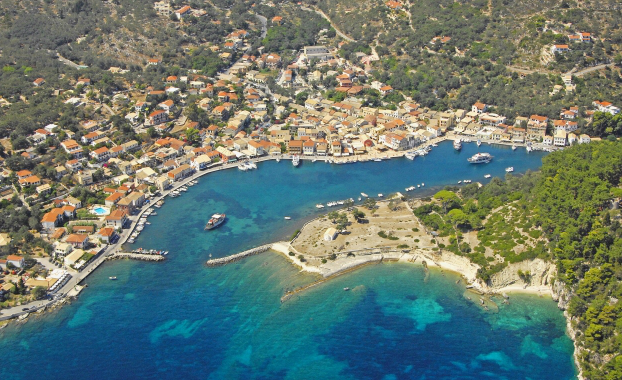 ↑ Aerial photo Gaios on Paxos island. 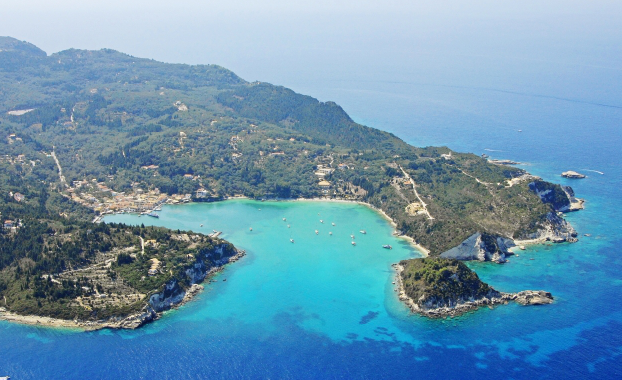 ↑ Aerial photo Gaios on Paxos island - closer in. 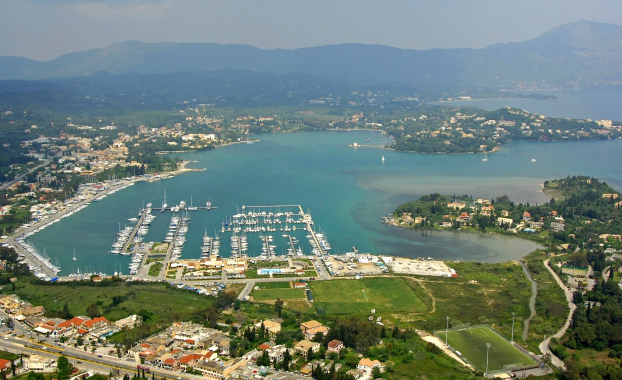 ↑ Aerial photo Gouvia bay on Corfu island. 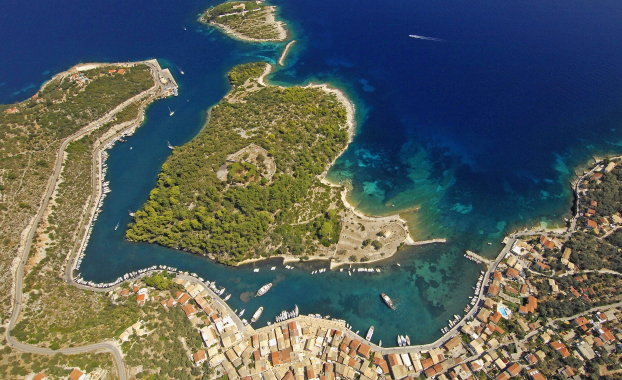 ↑ Aerial photo Lakka on Paxos.